Too Many Thoughts: What do Freemasons eat for lunch? On Friday, ampulets and I ventured on a not-so-undercover mission to find out what it is the Freemasons have for lunch. This comes after days of walking past the sign outside the Freemason Hall informing passersby that their restaurant a) is open to the public, b) offers set lunches for $9.80 and c) accepts telephone reservations. I don't know what the Freemasons are about, but the restaurant's interior consists of lots of dark wood panelling, elegant chandeliers, portraits of a young Queen Elizabeth II and Prince Philip, among other luminaries, and framed display pieces on the walls that showcase Freemason togs and weathered-looking pseudo-parchment pieces about Solomon's Temple. When I entered, I told the waiter I was meeting a friend and he responded, "What's his good self's name?" At least, that's what I think he said; I was too busy being mildly perturbed that the other three or four occupied tables consisted of business-looking-types in business-type suits who could have passed for actual Freemasons. But that's just first impressions for you. As it turned out, lunch was largely impeccable --- good service, good food, all in a nicely coiffed environment that couldn't more be at odds with the busy streets and humid weather outside. As ampulets remarked, it immediately feels like you're in the UK. ampulets had the roast chicken, I had the poached dory, and I'm sorry the photograph of my dory didn't turn out well because it was the prettiest dory I'd ever seen: three coils of soft white fish fillet crowned with fragrant garlic butter. 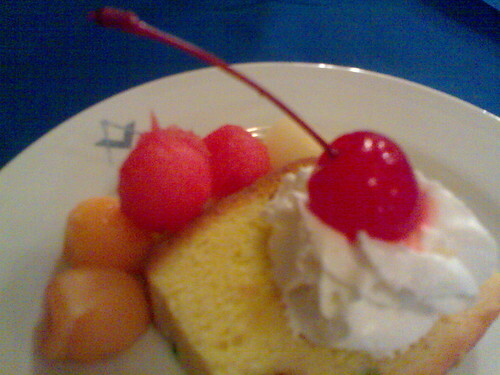 The only letdown was the dessert, which was a slice of butter fruitcake served fresh from the fridge. We just had the melon balls. And the photo, to prove that we ate at the Freemasons'. On our way out, as I was pointing out the antiquated sign directing the way to the "Ladies Powder Room", we must have loitered for half a second longer than permitted for non-members because an old Chinese man popped out of the door beside the restaurant to ask if he could help us. Nevertheless, this is quite the cosy nook to pop in for a peaceful lunch in what I am coming to think of as the old city area of downtown. A wedding party even trooped in for a late déjeuner from the nearby Registry of Marriages, which made ampulets and I go, of course this would be the perfect place for that. The set lunch changes everyday. ampulets and I are next coming back on a Thursday, for the prawns provence with pasta and the brownies. I know you don't like Nick Cage, but watch National Treasure. You can get a rough idea of what they do, from there. Plus a little bit of an American civics lesson about the Liberty Bell and all that stuff. It's a whole lot more interesting than Sang Nila Utama. I never imagined in my life someone would suggest National Treasure as a Freemason educational tool. Anyway, we'll never know because we're women and women cannot join the Freemason. Sad you didn't get a picture of the dory either. But, usually, when I'm truly into eating something, I don't take a picture. Your photo of the disappointing dessert proves my theory. i sure as hell am going there! i'll also practise my master mason secret handshake on the people there to see if i get it right. p.s. what are the opening hours? ask if they have flourless chocolate cake. that's quite good there. its sunday brunch is open to the public too. hmmm...the temples beneath and the bar's still off limits to the public though. but a bottle of Black Label there is S$80. woots. tinkertailor > They're open for lunch 11 am - 3 pm. Not sure about dinner; the billboard outside doesn't say. Imp> Pray tell how you know so much about the place! hey tym: i've a couple of friends who are freemasons. that's the usual chillout place on some weeknights for us. 1 even held his wedding in the temple on the 2nd level. lovely stained glass windows. too bad i'm female. the Freemasons lodge here doesn't initiate females into the group. duh. Not that it's really relevent, but i just ate some leftovers from last night, apple-chips with a Sprite. Does that count as What a Freemason eats for lunch given i'm a Freemason? I was just surfing on freemason stuff and bump into your blog. Will perhaps try to have lunch there too. Will stick with chicken.